Let me show you in this before and after how important design really is. 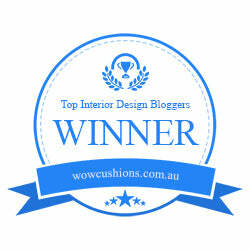 A little bit of design inspiration goes a long way and is money well spent. 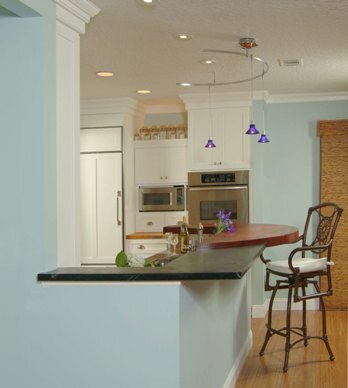 This kitchen was partially enclosed by a wall that separated it from the family room and a view of the waterway. Removing the wall made both rooms appear much larger than they actually were. I knew that I would be improving the view from the kitchen and creating a more socially inviting atmosphere. To enhance the social gathering aspect of the design I added the radius Mahogany wood counter for sitting. I used a combination of black Soapstone and the Mahogany together. Using two different contrasting colors of material really makes the radius top pop. When transitioning two materials it is important to increase the thickness of one to allow for a proper transition. I highly recommend an application such as this be designed and implemented by professionals. Both materials are expensive and it is a delicate puzzle to piece together. When you open up a small kitchen to an adjacent room, it helps to build the cabinetry up to the ceiling using a two piece crown molding and running the molding around both rooms. This visually tricks the eye and leaves you feeling that the ceilings are taller and the rooms are more spacious. I replaced the old refrigerator with a 30-inch Sub-Zero and matching cabinetry door panels. 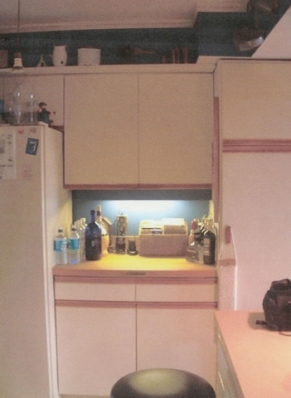 The old refrigerator took up to much space and protruded into the kitchen. The new refrigerator is countertop depth and virtually disappears. 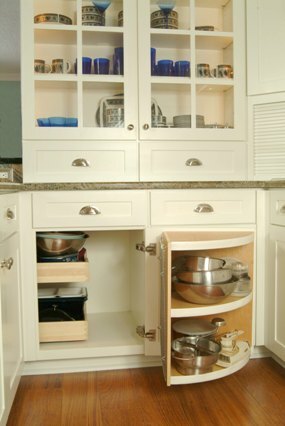 The single oven is placed into a tall pantry cabinet for proper ergonomics to the user’s height. 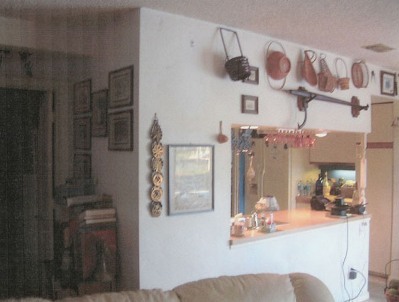 This application also gives wonderful storage above and below having everything within reach. I brought the wall cabinets down to the counter top and placed the microwave at eye level. The wall cabinet was shortened to allow display storage for the customers antiqued canister collection that had been his grandmother’s. 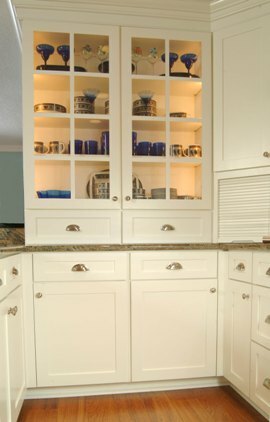 Dish Pantries are a great idea for the open kitchen design. 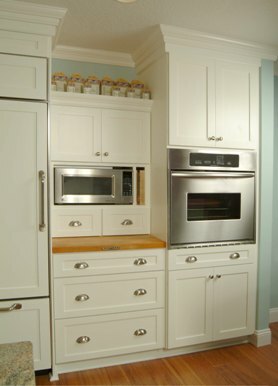 Running the wall cabinets to the counter adds an addition storage shelf that is more accessible to most people. 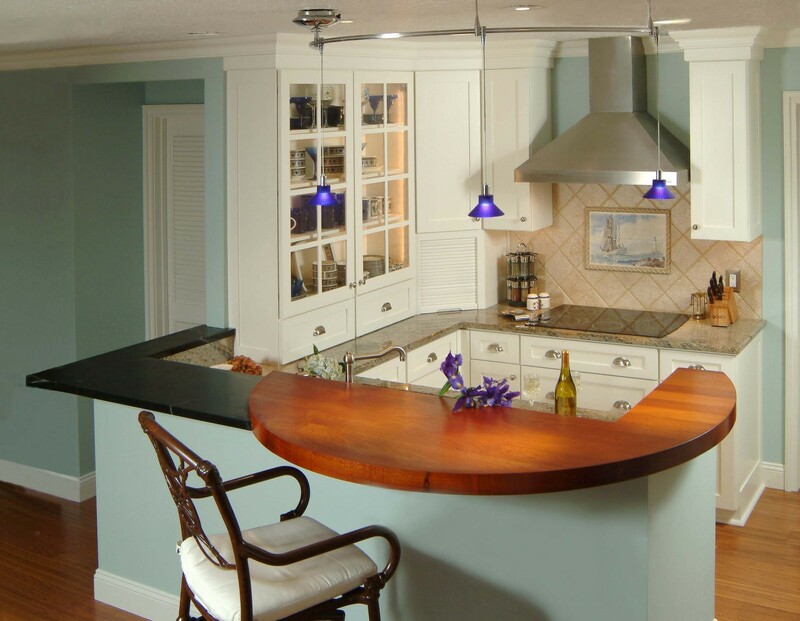 Studies on ergonomics have shown the person only uses the first 16-inches of countertop depth which means you are not losing valuable countertop for prep and you are gaining in cabinetry storage. Do not kill the corners. Make your corners accessible either by a lazy susan or a base corner turnout like the ones I added here. There is no reason to have dead space in a new kitchen design.